Am I on a roll or what?! I've actually managed to post 2 national food day recipes ahead of time, 2 weeks in a row. I'm awfully proud of myself right now, especially since I usually end up scrambling at the last minute to clean up some pictures and post a recipe. September 17 is all about Apple Dumplings! 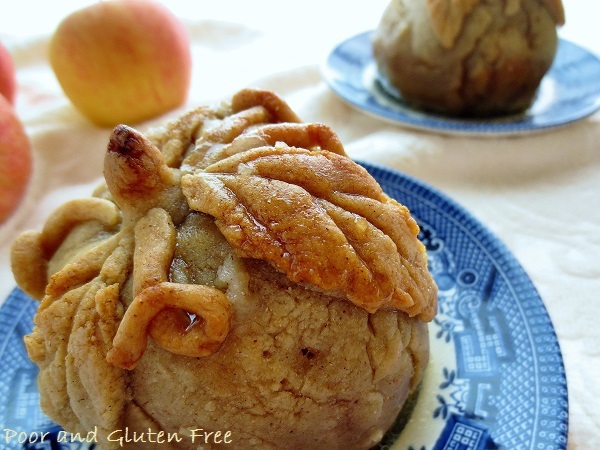 And in honour of it, I've created a slightly healthified Gluten Free Apple Dumplings recipe. And my husband's response after biting into one? "Ohh... so you only made three of them? Damn." Unfortunately, just like National Hot Cross Bun Day I haven't been able to find out anything about the origins of this national food day. I wish I could tell you more, but there is some vague reference to it going back a few centuries to medieval Europe. If anyone knows more I'd love to hear about it! So I've never had apple dumplings before, nevermind gluten free ones. But when I saw this day on a food calendar I knew I had to give it a try. But most of the recipes I found were baked in a thick, sugary syrup. Some even called for a can of Mountain Dew. Sorry, but Mountain Dew is a super sugary, corn syrupy, chemical laden concoction that includes "yellow #5" (although in some places, apparently the ingredients change depending on what country or state it is sold in, this seems strange, no?) Oh, and vegetable oil. Whaaa? So my version is made with a very light honey syrup which you can even do without if you prefer. You can find the recipe below, but here's a little photo tutorial to show you how I put mine together. Roll out the pie crust very thin. Cut into squares 6x6". Place apple in centre and sprinkle with cinnamon and sugar, top with a small amount of butter. 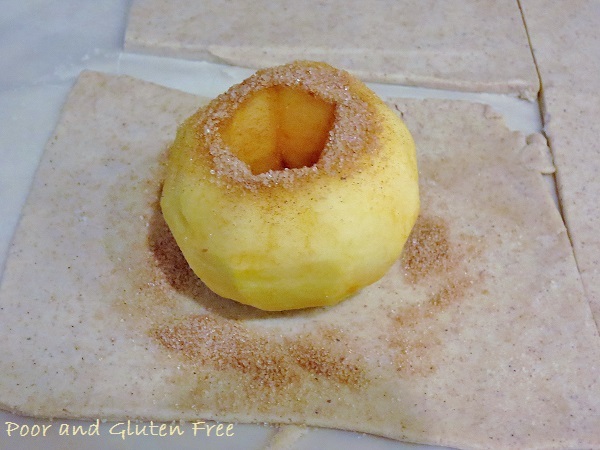 Fold dough up over apple. Pinch sides. You can leave them here as more of a square shape OR mold the dough around the apple so it is smooth and more apple shaped. Prick dough with a fork to allow steam to escape. Drizzle with syrup and bake approximately 40 minutes. 1. Heat water enough to dissolve honey. Stir in optional orange blossom water and lemon juice. 2. Mix together brown sugar, cinnamon and nutmeg. 3. 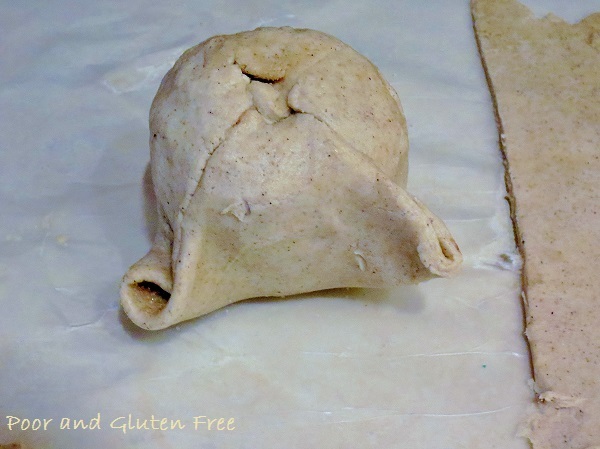 Roll out pie dough approximately 1/8" thick on a flat surface, either sprinkled with flour or on wax paper. Cut into 3 6x6" squares. 3. Place apple on centre of square. Sprinkle inside and around apple with 1/3 of the cinnamon and sugar mix. Add nuts and raisins if using. 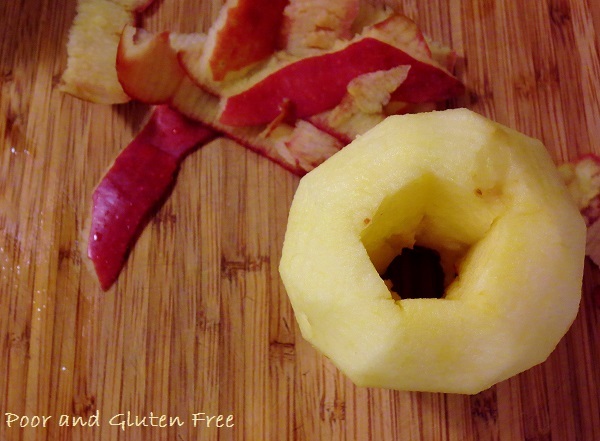 Place butter on top of hole in apple core. 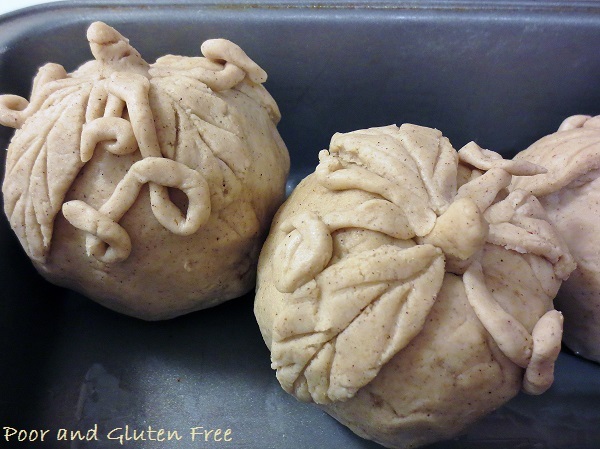 Fold dough up over apple, press edges together at the seams and decorate with leaves if desired. Prick dough in various places around the apple with a fork to allow steam to escape. Place apples in a baking pan (I used a loaf pan since it fit 3 apples perfectly) and drizzle with syrup. 4. Bake approximately 40 minutes, until apple is soft. Serve with syrup spooned over top. 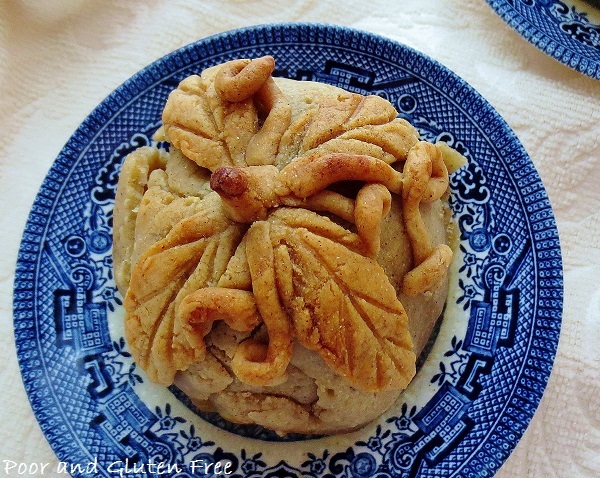 Have you ever tried apple dumplings? Do you have a favorite way to make them? Yum! And so pretty too! 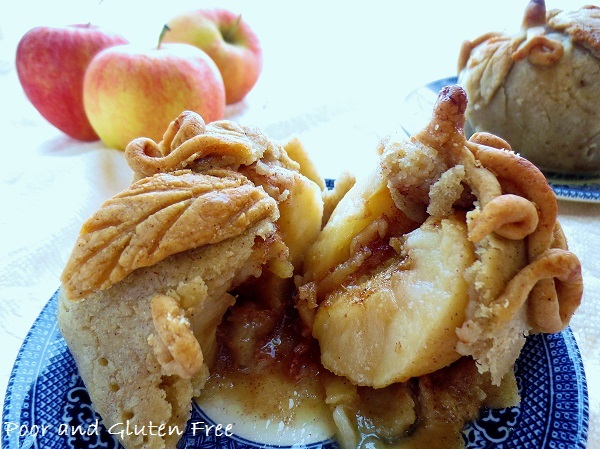 Wow, these apple dumplings are just beautiful! 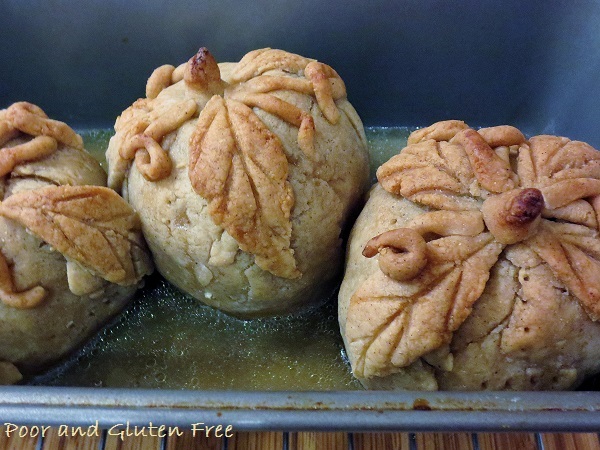 I have never made apple dumplings before, but as lovely as these look and with the weather turning cooler, I think I will give them a try. Thanks, Linda. I'd never made them before this weekend, either, but I think they will become a staple now because my husband loved them so much! This is so pretty and looks tasty too. I don't know if I have the patience to create such pretty leaves and vines. 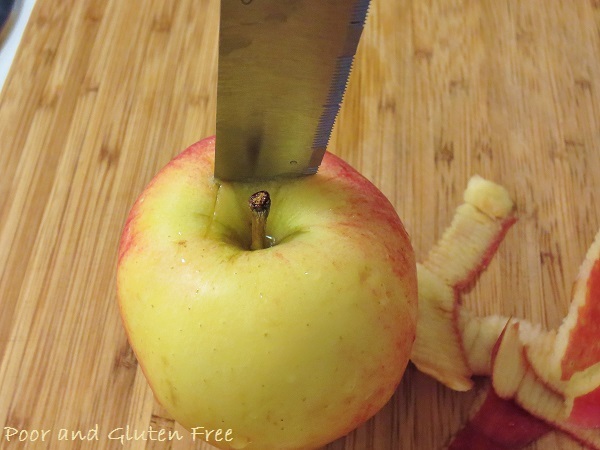 I found your recipe through Gluten Free Fridays. a giant apple pie! 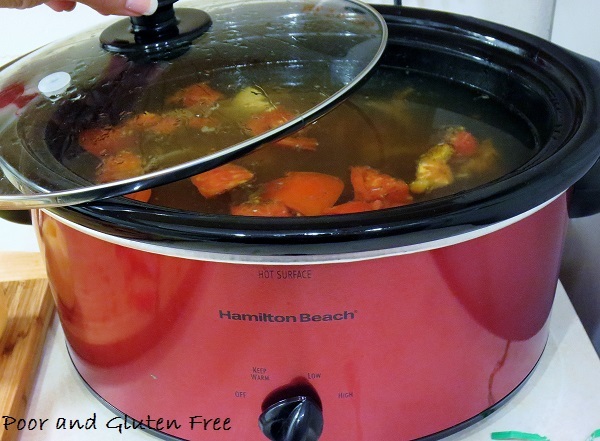 Featuring your recipe this week Danielle, thanks for sharing with us! Beautiful! They look and sound delicious! Love apple recipes! 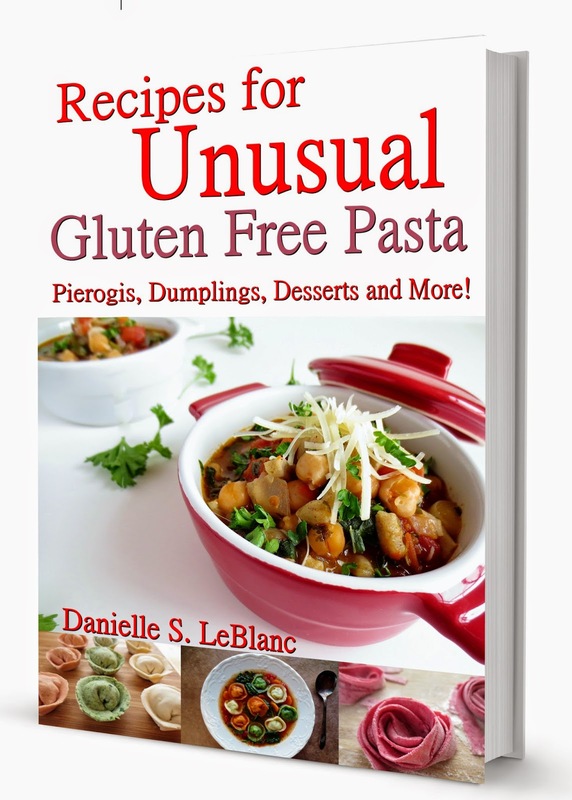 Thanks for sharing on #glutenfreefridays! Beautiful I am Highlighting this recipe on this weeks Hearth and Soul blog hop. Your dumplings are beautiful! What lovely pastry, and they sound delicious too. Thank you for sharing them with us at the Hearth and Soul hop. How important is the xanthan or guar gum in your pie crust recipe? It looks wonderful, but I don't like to use those ingredients. Ok, so I made the crust without gums yesterday (for pumpkin pie) and it turned out awesome! In fact, I think it's flakier without it, and my husband said he loved it. I've changed the recipe on the pie crust page, so it doesn't call for gum anymore. Thanks for asking, Kristi! Apples are considered as one of the most perfect health foods available to us. They are consumed raw in their natural state, and contain an abundance of health giving nutrients, as well as a lot of fibre. The fibre in apples is known as pectin, and it is associated with the lowering of cholesterol, and the stabilization of blood sugar. Pectin also helps to keep us feeling fuller for longer, and reduces appetite and cravings. A great recipe I can't wait to try out. I love apples and cinnamon, and especially dumplings! I came up with a related recipe for Apple Dumplings in a cinnamon sauce. While different from your own, I think mine is a unique take on the dish. I'm new to the Food Blog scene and would love some feedback from a pro like you. Check out my recipe if have time. Oh these look simple and yummy! 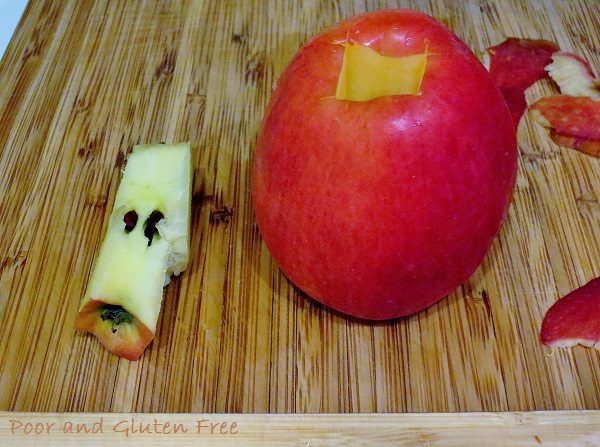 I have so missed apples..I am going to try these and will let you know how they turn out!